computes the moment of inertia for the region reg rotating around an axis through the point pt in direction v.
computes the moment of inertia matrix for the region reg relative to the center of mass. 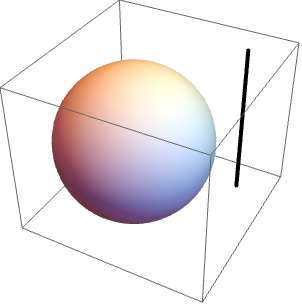 computes the moment of inertia matrix relative to the point pt. Moment of inertia is also known as rotational inertia, area moment of inertia, and mass moment of inertia. The moment of inertia matrix is also known as rotational inertia matrix and angular mass matrix. Moment of inertia is the resistance to rotational acceleration for rigid bodies and is the rotational analog of mass, which is the resistance to translational acceleration. where reg is the region reg translated by -pt. MomentOfInertia computes a result under the assumption that the mass density of the region is constant.